“In 1492,Columbus sailed the ocean blue” … hoping to discover a new world for Spain. On October 12, 1492 Christopher Columbus succeeded and we honor him by observing Columbus Day. 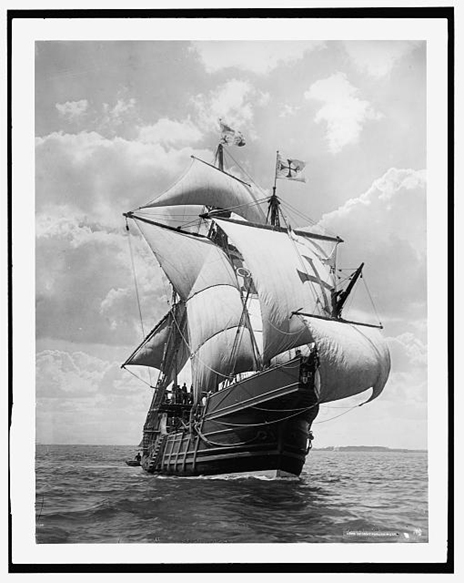 In 1937, President Franklin D. Roosevelt proclaimed October 12 as our annual Columbus Day. Later, President Richard Nixon declared Columbus Day as a national holiday to be observed on the second Monday of October each year. This year, Columbus Day is being observed on Monday, October 14th. Check out the related collections found on The Library of Congress’ website. There you will locate a number of collections with material to use this month, including lesson plans and themed collections. These will be valuable resources for your lesson plans. Parallel Histories: Spain, United States and the American Frontier– explores the history of the Spanish presence in North America from the first voyage of Columbus in 1492, to the continued exploration and settlement of California and the American Southwest in the early 19th century. 1492: An Ongoing Voyage (Exhibition) This online exhibit focuses not only on the Northern hemisphere before 1492, but also on those who arrived from Europe and Africa in the 16th and early 17th centuries. Cartographic Formation of the North American Continent (Exhibition) This animated presentation depicts the emerging European world view of North America from the time of Columbus in the late 1700′s. Images of Christopher Columbus and His Voyages (Prints and Photographs) This will link you to two dozen images related to Columbus. Columbus Day written by Carmen Esparza, a teacher at Lincoln School, is a lesson that honors the explorer Christopher Columbus, who first landed in the New World on October 12, 1492. The First Thanksgiving– This is a small unit created for a kindergarten classroom by Nancy Brazzale, a teacher at Momence District 1 in Illinois. She took primary source pictures from the Library of Congress to give students an authentic view of pilgrim life and the first Thanksgiving. Thanksgiving– Kindell Smith designed a lesson for 6th-8th grade students taking them on a maiden voyage to a brand new world. Apply for Spring EDUC 7212– Digital Primary Sources will be Saturdays (9:00AM– 4:00PM). First 20 applicants’ tuition paid though a grant provided by the Library of Congress! This graduate course will help teachers in their design of inquiry-based lessons that use the rich reservoir of primary sources. Expand your students’ horizons with maps. Are you seeking some new educational destinations? Do you want to explore new terrain in your classroom, but don’t know how or where to begin your journey? Primary source maps can be used for much more than navigating the Interstate or pointing out the thirteen original colonies. They are a great tool for critical thinking and inquiry-based learning activities, and they offer a welcome alternative to text for visual learners. This three-hour Seminar will introduce you to using maps in a variety of ways and subject areas that you may have not considered before. Teaching Math through Mapping Skills will also be addressed.